Pie crust is the thing I get the most questions about. I'm here today to take the mystery out of homemade pie crust. Once you "get it," you'll never use store-bought pastry again. 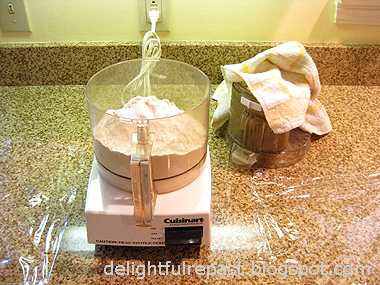 Today's tutorial utilizes a food processor, but I'll give the strictly by hand version next time. I make different amounts of pastry, depending on what I'm making. But if you're new at making pie crust, I'd suggest you stick to making the same recipe in the same amount every time, until you've mastered it. The recipe below calls for 2 1/2 packed cups (12.5 ounces) of unbleached all-purpose flour and makes enough pastry for one 9-inch double crust pie or two 9-inch pie shells. I've still not tried the recipe that calls for vodka in place of some of the water. It might work, it's just that I've never had the problem that the method is supposed to solve, so ... And then there are recipes that call for an egg or sour cream, milk or buttermilk. You might want to try them all eventually. But, as I said, it's best to master one before branching out. 1 With metal blade in place, add flour, salt and baking powder to work bowl of food processor. Turn on for three seconds to combine. Add half the frozen butter and pulse for six 1-second pulses or until the frozen butter is the size of large peas. Add remaining butter and pulse for three 1-second pulses. 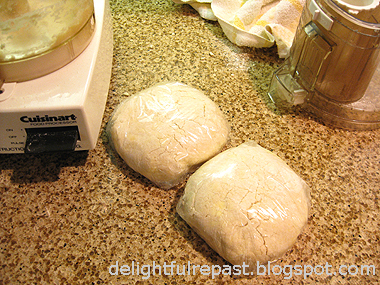 3 Turn dough out, dividing onto two pieces of plastic wrap and flatten each slightly into a 4-inch round disk; wrap; refrigerate for 30 minutes. If you're making two pie shells, make the disks the same size; if you're making a double-crust pie, make one disk a little larger for the bottom crust. Note: You can even freeze the dough at this point, wrapped well, for up to a month. 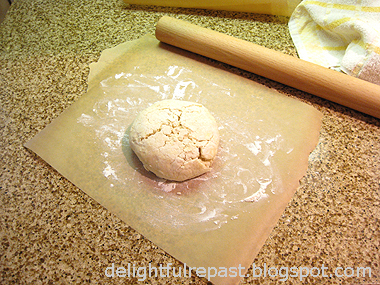 To defrost dough, move it from freezer to refrigerator for one day before using it. Let stand at room temperature for 15 minutes before rolling. 5 When making a two-crust pie, save the plastic wrap again (yes, again - I'm pretty fanatical about using as little of the magic stuff as possible) and roll out the bottom crust between two 12-inch squares of parchment, rolling from center to edge a few times and rotating by quarter-turns to attain round shape. (And you don't really need to worry all that much about getting it perfectly round as you'll be trimming off the excess anyway and can make it round then.) It should be 13 inches in diameter and about 1/8 inch thick. Remove the top paper and transfer dough to pie plate, paper side up; remove paper, cover with reserved plastic wrap and refrigerate. Roll out top crust (again, save the plastic wrap) and place it on a rimless baking sheet; cover with reserved plastic wrap and refrigerate. Make pie filling. Then assemble pie and bake as directed. 6 When making a single-crust pie, roll out and transfer to dough to pie plate, pressing dough (but not stretching it) to fit pie plate with a half- to one-inch overhang (trim with knife or scissors), crimp edge, cover with reserved piece of plastic wrap and chill until ready to bake. If blind-baking crust (baking the empty pie shell), preheat oven to 375 degrees. 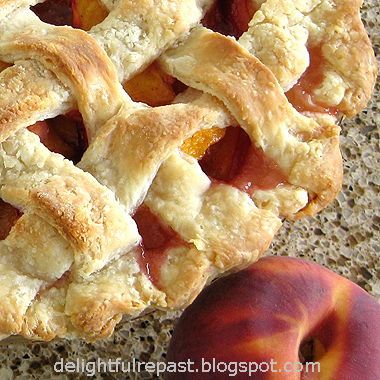 Put a pie tin inside the pastry-lined pie plate and bake for 25 minutes. 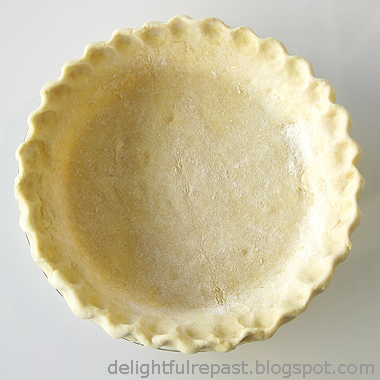 If partially baked crust is needed, remove pie tin and proceed with recipe. If fully baked crust is needed, remove pie tin and continue baking another 10 to 12 minutes until golden brown. * I've had my Cuisinart DLC-10E since I was a girl, so as you might imagine, it was discontinued long ago. Check out the Cuisinart 11-Cup Food Processor I have now; the other one is still going strong in a friend's kitchen! This is great, illustrated information Jean, Thanks! I had been using your cobbler recipe to make pies, even my pumpkin pie I made over Thanksgiving. I like your idea of using parchment paper while rolling the dough out. It probably helps to keep it from pulling back and also uses less flour that way. I know there's a pie in my future sometime soon! Thanks, Richard! And within the next couple weeks I'll be posting the handmade version. Even if you plan to use a food processor, that next post might still have some useful tips for you. You can do it! Thanks, Judy! And thanks for the Pin! Let me know how this turns out for you. Marina, thank you. And you're so right about the photos - I was trying so hard to not get flour and dough all over my camera! Now that's a perfect crust recipe. Thank you, Jean, for the detailed instructions. Thanks, Angie. I do love the flavor of an all-butter crust. And this is a pumpkin-pie-for-breakfast kind of day! Aaw, Greg, you're too kind! Thanks, Pegi! I hope you guys like it - let me know. Thanks, Mary! And don't the packaged ones have a lot of chemicals? Whenever you're in the neighborhood, come on over for a lesson! Hi Jean - call me a heathen but I have to say I'm not a huge fan of all butter pastry. I find it... *too* buttery, and that's saying something because I sure love my butter. I usually use a half/half mix of butter and vegetable shortening as it reduces the richness a great deal! Hi Charles - I understand what you're saying. Maybe I'm just used to all that richness because I've been making and eating all-butter pastry for soooo long. Thanks for this! I've had to make these alternative crusts for work for so long (no saturated fats, GF, whole grain, etc) that I never quite mastered the original. Perhaps I'll make a savory pie or tart for dinner this week and give this crust a go! Thanks, Karen. I know what you mean! I know so many "special dietary needs" people, which is why I've developed so many gluten-free recipes. And I tell a cute Julia Child story about whole wheat crust in my Vegetable Quiche post. Ah Jean you can't beat good pastry and this pastry looks very good. I see you have a granite kitchen top. Where do you source granite from in North America? We get granite from all parts of the British Isles, especially in the South West on Dartmoor and in the Scottish Highlands. Aberdeen is built of granite.It's called the granite city. The Volcanic outcrops that dominate Edinburgh are granite too. I love the choice of colours you get with granite, pinks, blacks and greens depending on the mineral composition. I should imagine it is ideal for kneeding, rolling and cutting pastry on. It's cool, solid and very very hard.No pastry is going to stick to a granite surface like glue!!!!! Tony, thank you! Pastry is one of the main reasons I chose a solid countertop (also called quartz or engineered stone) when we remodeled the kitchen 6 years ago. 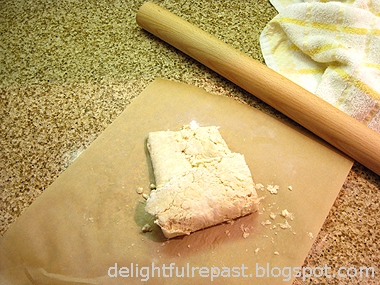 At one time I had a beautiful tile countertop (4-inch square ceramic tiles) that did not work for rolling out pastry. AND I was forever bleaching berry stains (love blackberry pie) out of the white grout! Jean, your pie crust is beautiful in every way...flaky, golden and presumably delicious! I also use an all-butter crust recipe, however I've bookmarked this for my next pie to see for myself how it rolls, bakes and tastes. I'm definitely looking forward to it. 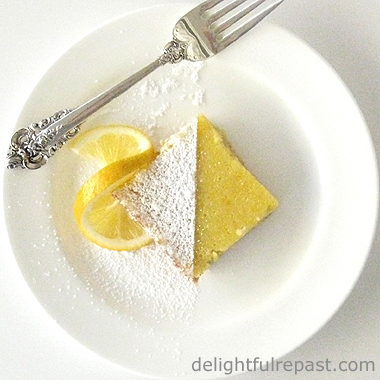 Thank you for sharing the recipe! Thank you, Brooks! I hope it turns out well for you. Isn't butter the best! Love this step by step post, Jean! I'm really not much of a baker outside of cookies and brownies, but pie crust is something I would like to master one day. 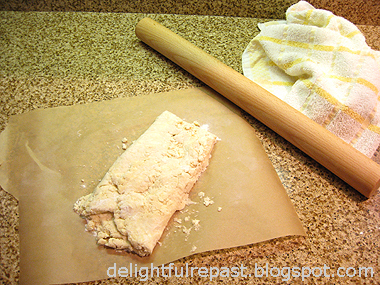 I have always found pie crust to be THE most challenging part of baking. Thanks for the tips! Thanks, Jenn! You can do this - definitely. I wish *I* wasn't a baker - would make it easier to eat right all the time! Lana, thank you. I hope the tips will work well for you. That looks like my food processor -- 26 years old. I've made pie crust in it, too, but not recently. Thanks for the link to a recent Cuisinart. Mine is losing bits and pieces. One day, it's going to lose a bit that will prevent it from working and I'll have to replace it. Thank you, Joy! If I ever have to replace mine, it will be with the one I linked. I just don't need one of those huge ones - I think some are 14-cup capacity. Thanks, a-boleyn. You'll get it, don't worry. But yours looked fine! Pies are like puppies, they're all pretty!